Used to establish keystones of identity, emotion, and culture, language defines many of the parameters of human life. In his novel, White Noise, Don DeLillo analyzes the power and limitation of language in a technologically advancing world. In examining notions of truth and deception, disclosure and repression, White Noise brings the very definition of language into question as human and technological voices converge and may become indistinguishable. When comparing White Noise to George Orwell’s essay, “Politics and the English Language,” a striking image is painted: with the ability to inform our sense of self, collective, and reality, we are our language. In treating these two voices as a conversation, DeLillo and Orwell can bring great insight into the power and limitation of humanity’s relationship with language. The power of language permeates White Noise on many levels, the most basic of which is Jack Gladney’s name. It becomes clear that a name is not simply a sequence of sounds, but a symbol of power or lack thereof. Indeed, a minute alteration in the language of a name does not solely morph sound, but creates a new identity. As a renowned expert in Hitler studies, Jack was advised “to do something about [his] name and appearance… to be taken seriously as a Hitler innovator… [for] Jack Gladney would not do” (WN, 16). With the addition of a single initial, Jack transformed into ‘J.A.K.’: a suitable character for the supposed knowledge and power of his academic position. Indeed, it is with exactly such terms that Jack expresses the sensation of his new title, as though he is a “false character that follows the name around” (WN, 17). As Jack’s truth is concealed, his previous identity is destroyed in favour of the creation of ‘J.A.K..’ Thus, DeLillo simultaneously identifies and satirizes the power given to language, as a virtually inaudible change in name ironically adorns an individual with supposed prestige, respect, and intellect. However, despite the linguistic endowments of a prestigious title, language remains the ultimate obstacle to Jack’s academic success: “as the most prominent figure in Hitler studies in North America… [he] did not know German” (WN, 31). He “sensed the deathly power of the language…. [T]he more he shrank from learning actual words, rules and pronunciation, the more important it seemed” to his career (WN, 31). Although Jack attempts to manipulate the social understanding of language in his favour for prestige, the basic learning of a foreign language remains beyond his abilities. Jack seeks to vicariously fulfill such social function as a real ‘German’ through the naming of his eldest son, Heinrich. Perhaps the character names of White Noise can be understood much like Orwell’s interpretation of ‘ready-made sentences’: “they will construct your sentences for you–even think your thoughts for you, to a certain extent–and at need they will perform the important service of partially concealing your meaning even from yourself” (Orwell, 4). While Orwell directly addresses overused and misunderstood ‘ready-made sentences,’ the same can be said for J.A.K. and Heinrich as Jack Gladney attempts to build a character facade through language. Jack describes Hitler’s “language…” as though it “came from some vastness beyond the world” (WN, 72), and thus wishes to endow his son with such power through a name that sounds like someone who could fulfill J.A.K.’s linguistic and social shortcomings. Thus, Jack hopes that the giving of this name will allow Heinrich to speak, think, and act like the powerful figure Jack wishes he could emulate–a ‘ready-made identity’. Thereby, language is understood as a communal tool for the construction and preservation of ego in White Noise. Beyond the creation of ‘J.A.K.,’ yet another instance of the false augmentation of character through language is identified by Winnie Richards, a distinguished yet mysterious scientist at University-On-The-Hill. As Jack echoes her renowned brilliance, Richards reminds Jack that “[they]’re all brilliant. Isn’t that the understanding around here? You call me brilliant, I call you brilliant. It’s a form of communal ego” (WN, 188). Orwell also touches on this phenomenon of language building communal ego, as he asserts that “in the case of a word like democracy, not only is there no agreed definition, but the attempt to make one is resisted from all sides. It is almost universally felt that when we call a country democratic we are praising it…” (Orwell, 3). Thus, not only can communal–yet hollow–‘brilliance’ be understood in terms of individual social standing, but national identity as well; although not through the term ‘brilliance,’ but through the no less self-congratulatory term, ‘democracy’. Thus, both White Noise and Orwell identify the desire to manipulate language for the augmentation of social standing, whether it be at the individual or collective level. As language is seen to be both socially manipulated and manipulating, White Noise explores the rampant falsity of language not only in its creation of identity, but as a means of survival. The notion that family exists for survival is not foreign; however, White Noise suggests that familial survival is directly related to language in its ability to suppress truth in favour of falsity. While “facts threaten our happiness and security,” “not to know is a weapon of survival” (WN, 81-82), a weapon supported by the family unit. As “the cradle of the world’s misinformation[,] [t]here must be something in family life that generates factual error… like the need to survive” (WN, 81). This phenomenon of family affecting survival through lack of fact is reciprocal, as “the family is strongest where objective reality is most likely to be misinterpreted” (WN, 82). Often, such a desire to misconstrue fact is due to fear of a threat which can be made illegitimate by manipulating its surrounding language. For instance, when Jack comes across passengers who nearly experienced a plane crash, the instinct to alter language and truth for comfort is evident. In order to maintain calm, the crew pretended “it was not a crash but a crash landing that was seconds away. After all, the difference between the two is only one word… they saw how easy it was, by adding one word, to maintain a grip on the future, to extend it in consciousness if not in actual fact” (WN, 91). Much like adding a letter to a name, a simple and willful manipulation of language once again proves capable of completely altering one’s perception, not only of an identity, but personal experience and reality. Therein, DeLillo and Orwell identify a common desire to manipulate language to misrepresent reality, masking its true hardships and wrongdoings. While White Noise presents such distortion of language as a defence mechanism for the easing of tension, Orwell identifies the dangers of allowing language to numb us to amoral realities. Much like the desire to stray from truth in order to avoid the harshness of fact, DeLillo identifies a common desire to relinquish ownership of one’s experiences–one’s truth–a feat proven achievable through language. Indeed, Jack heard the entirety of the story of the passengers’ experience from a single individual, as the other passengers gathered round and “trusted him to tell them what they’d said and felt” (WN, 91). Thus, as language is seen to create individual and collective experience, both DeLillo and Orwell question the retelling of reality. Such examples all pertain to the voluntary manipulation of language, self, and experience for personal gain. However, the opposite phenomenon also occurs in White Noise: language manipulates involuntary individuals. Orwell asserts that “if thought corrupts language, language can also corrupt thought.” (Orwell, 4). The former has been proven to be true by the willful manipulation of language, and the latter is perhaps best encapsulated by ‘the power of suggestion’ exemplified in White Noise. 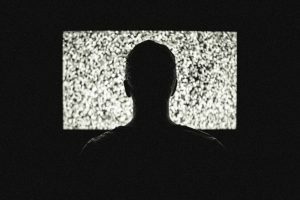 Often perpetrated by the omnipresent voices of radio and TV, the power of suggestion pervades the home, psyche, and disposition of all of those in White Noise. Given the looming threat of the toxic black cloud over their town, the TV and radio voices relay information about the cloud and its effects; however, such information is often later corrected due to more current knowledge. As Jack’s daughter began to experience the initial side effects which had since been proven untrue, it remained unclear if her “palms had been truly sweaty or whether she’d simply imagined a sense of wetness”: was she “so open to suggestion” that she could physically adapt to such language? (WN, 126). Therein lies the ability for language to control personal experience no matter the true situation. Such a phenomenon becomes all the more disconcerting as the world of White Noise relies on false information, and thus false language, in favour of truth. While some use false language in order to suppress fear, at other times language itself is repressed. Much of the language in White Noise pertains to the subject of death, and fear of such a fate. When Jack asks why he has “had this fear so long, so consistently[,]” Murray, his friend and confidant, proposes that he “doesn’t know how to repress. We’re all aware there’s no escape from death. How do we deal with this crushing knowledge? We repress, we disguise, we bury, we exclude” (WN, 288). Once again, facts are deemed a danger to humanity, and thus, Murray proposes that to cope, repression of such knowledge “is the natural language of the species” (WN, 289). In this inversion of logic, White Noise presents repression as an opposing ‘language of the species,’ in that language may be as much what is not said as what is said. Although, Jack represses fact by “turn[ing] off the radio, not to help [him] think but to keep [him] from thinking” (WN, 126), the validity of repression as a language, a tool of knowledge, must be brought into question. In making truth its primary target, the language of repression enforces deception as a mechanism to control fear and identity. Yet, Orwell views language “as an instrument for expressing and not for concealing or preventing thought” (Orwell, 5)–bringing doubt to the integrity of repression as a ‘natural language of the species’. Willie’s affliction comically exemplifies the poststructuralist assertion that language shapes reality, rather than merely labeling it. Language has, among other properties, the uncanny ability to say the thing which is not, to participate in the constructing of hypothetical realities that are sometimes ontologically potent, sometimes merely verbal, and som etimes both (Cowart, 86). In yet another demonstration of the power of suggestion, yet all the more concerning, Willie Mink is seen to become a prisoner of language in an attempt to escape the reality of mortality. Thus, although repression is utilized as an attempt at control, language is seen to ultimately regain power. Therein, one of Orwell’s greatest concerns is actualized in White Noise as he warns that “what is above all needed is to let the meaning choose the word, and not the other way about” (Orwell, 5). As words are seen to control the consequent meaning and reality in White Noise, the power of suggestion becomes overwhelming. Repression of truth transcends language to reach the realm of secrets–something that is kept unknown or unseen by others. When Jack comes to possess a gun, “a concealed lethal weapon[,] it was a secret, it was a second self” (WN, 254). Therefore, just as language constructs Jack’s academic identity through titles and ascribed ‘brilliance,’ the repression of language–a secret–creates yet another self; although, perhaps repression was at play all along, as Jack used language to create a new identity and in doing so repressed his true self––his secret. With this newfound power in lack of language, Jack wonders if “secrets [are] a tunnel to a dreamworld where you control events” (WN, 275). Although language has previously been treated as a mechanism to control the construction of self, experience, and reality, Jack utilizes tools of repression and secrets to halt the language, and thus the reality, he does not want to face. Therefore, both language and the lack thereof prove capable of attaining control; however, when confronted with characters such as Willie Mink, the degree to which this control is authentic remains uncertain. As silence emerges in White Noise, that which had been stirring quietly in the background crescendos–technology begins to blare. What began as a single, minute, detail of “the TV said: ‘Now we will put the feelers on the butterfly’” (WN, 96) was soon endowed with an identity: “‘the voice on the radio said: ‘Available for a limited time only with optional megabyte hard disk’” (WN, 112). No longer technological but solely “the voice at the end of the bed” (WN, 178), white noise becomes indistinguishable from human language, as one night Jack “heard a voice and thought [Babette’s father] was moaning in his sleep… [Jack] went into the hall [and] realized the sound came from the TV set in Denise’s room” (WN, 249). The key to the progression of technological white noise to humanity evidently lies in language. Therefore, as the characters of White Noise abandon the integrity of language in favour of falsity and repression, they stray further and further from humanity. As ignored background muttering advances to the forefront of thought and conversation, white noise in itself becomes language. In a juxtaposition of silence and language, humanity and technology, Jack describes how the family “drove home in silence. We went to our respective rooms wishing to be alone. A little later I watched Steffie in front of the TV set. She moved her lips, attempting to match the words as they were spoken” (WN, 84). Thus, as the parental unit resorts to silence, technology is seen to take on the parental role by bestowing the gift of language. In one of the most heartfelt moments of White Noise, Jack watches his daughter sleep as “Steffie turned slightly, then muttered something… [he] was convinced she was saying something, fitting together units of stable meaning… She uttered two clearly audible words, familiar and elusive at the same time, words that seemed to have a ritual meaning, part of verbal spell or ecstatic chant. Toyota Celica.” (WN, 155). Although one of the most ‘human’ moments of White Noise, ironically, technology is seen to takeover one of the roles most integral to humanity: the teaching of language. The words ‘Toyota Celica’ that had previously blared from a TV or a radio were not at the forefront of human subconscious. As white noise transcends the realm of technology to penetrate that of humanity, Jack admits “a simple brand name, an ordinary car… near-nonsense words, murmured in a child’s restless sleep, make [him] sense a meaning, a presence [yet] she was only repeating some TV voice” (WN, 155). This ‘TV voice’ was now a real, human voice, taking on the role of a virtual parent by bestowing the gift of language–white noise had become part of human language. The hopped-hysteria of mass advertising has really been saying all along […]: You are afraid of dying; let this phrase, this sound-bite, this whirling bit of language so pervasive worldwide that it can serve as common coin in Sri Lanka or Schenectady, Rio de Janeiro or Reykjavik let it soothe your fears; let your dread dissolve in the chanting of this media mantra (Bonca, 10). Thus, Steffie’s utterances of white noise can be understood as “an example of the death-fear speaking through consumer jargon” as she “incorporates the terror… and in sleep communicates her fear in the only she knows: babbling ‘Toyota Celica’” (Bonca, 9). Given that ‘the death fear’ is communicated in such “demotic language,” it can be understood as a rampant fear affecting people from all walks of life (Bonca, 10). Thus, perhaps DeLillo ultimately “see[s] language as a massive human strategy to cope with mortality” (Bonca, 1), whether it be through a name, communal ego, repression, secrets, or even white noise. Yet, even as a coping strategy for mortality, the effects of language are considered lethal in White Noise. When Murray asserts that to kill “is a way of controlling death… [as] you can’t die if he does” (WN 291), Jack uses language as a tool to torture Willie Mink. Words and weapons are likened in White Noise as Jack recounts he “gripped the firearm… [and] said to [Willie] gently, ‘Hail of bullets.’ Keeping [his] hand in [his] pocket. [Willie] hit the floor, began crawling… childlike” (WN, 311). In adopting words as weapons, Jack creates a “slow and agonizing death,” rather than the finite pain of a single bullet (WN, 312); however, even when Jack does fire the gun, he describes “white noise [being] everywhere” (WN, 312), interweaving the use of language with that of weapons. This scene in White Noise is particularly revealing, as the capacity for language as a coping mechanism for mortality is contrasted with the lethality of language, exposing the dichotomous nature of language in terms of life and death. Interestingly, the Gladneys never turn to religion as a means of coping with the fear of death. Yet, when Jack seeks medical and emotional aid following his attempted murder of Willie Mink–the moment in which the threat of death is perhaps most immediate in all of White Noise–“Delillo deconstructs the very representation of belief” by bringing doubt to the “naive equation: we believe that the nuns believe” (Cowart, 86). Therein, DeLillo reveals that “the nuns believe only that we must believe they believe: a circularity, which is the circularity, the infinite deferral, of language itself” (Cowart, 86). Thus, the voice of religion can be understood as yet another form of white noise, since “they don’t ‘believe’ their teachings[,] they help people evade death with a torrent of doctrine, litanies, catechism–language. The church’s job is to give comfort, and the white noise of religion provides that” (Bonca, 10). Thus, White Noise likens the forces of technology and media with that of religion, as they both contribute to the repression of the fear of death through language. Initially “Jack rejects [the nun’s] argument, insisting that real belief is necessary, that it is the substance of the belief that counts, that the Church can’t just be pretending” (Bonca, 10-11), seemingly unaware of his own parallel actions. Nevertheless, in pretending to know German, assuming the character of “J.A.K.,” repressing the fear of death, and keeping secrets, Jack also relies on belief, whether of himself or of others, in order to misrepresent reality with language. Exasperated by Jack’s inability to understand her, the nun begins “spraying [Jack] with German[,]” bringing his social facade to the forefront (WN, 320); yet, seemingly intoxicated by the nun’s cloud of Germanic white noise, Jack admits he finds it “beautiful[,]” just as he found Willie Mink’s fear “beautiful” as he tortured him with language (WN, 312 & 320). Thus, it is evident that Jack finds beauty in the overwhelming power of language, as he idolizes Hitler and his command of the German language. Therein, Jack finds the same beauty and fulfillment in the moment he most resembles Hitler, using language as a weapon on Willie Mink; however, as Jack finds comfort, even beauty, in the nun’s “scornful prayer” (WN, 320), even after the falsity of religious belief has been revealed to him, the degree to which Jack is truly in control of language must be brought into question as he, much like Willie Mink, remains willfully enveloped in white noise in order to repress the reality of mortality. While White Noise addressesses the mortality of people through the use of language, Orwell examines the mortality of language itself. Orwell asserts that “a newly-invented metaphor assists thought by evoking a visual image, while on the other hand a metaphor which is technically ‘dead’ […] has in effect reverted to being an ordinary word” (Orwell, 2); however, not only is such language ‘dead’, but “a speaker who uses that kind of phraseology has gone some distance towards turning himself into a machine” (Orwell, 4). Perhaps Orwell’s notion of ‘dead’ language can be understood as a sort of ‘white noise,’ lacking in novelty and relying on the tools of repression to halt the realities that come with sincere language. Furthermore, as ‘dead’ language is utilized as a coping mechanism for mortality, the speaker becomes dehumanized–a ‘machine’–distancing themselves from the possibility and fear of death. Orwell explains that “when there is a gap between one’s real and one’s declared aims, one turns, as it were instinctively, to long words and exhausted idioms”–dead language (Orwell, 4). Thus, through repression, secrets, and distortion of language, the characters of White Noise ironically utilize white noise–‘dead’ language–in an attempt to shield themselves from their own mortality. White Noise offers a satire of the relationship between humanity, language, and mortality; yet when considered alongside George Orwell’s essay, “Politics and the English Language,” White Noise’s elements of humour, irony, and even exaggeration are shown to be deeply rooted in reality. As Jack takes on a new linguistic identity for prestige, a communal ego is achieved by the simple, yet hollow, saying of ‘brilliance,’ the spoken side effects of a chemical cloud become real, or experiencing a crash landing rather than a crash, White Noise asserts that we are our language. Thus, in revealing that we are what we think, say, and hear, White Noise and Orwell prove the power of language as it informs individual and collective identity. Bonca, Cornel. “ Don DeLillo’s White Noise: The Natural Language of the Species.” College Literature 23. 2 (June 1996): 1–25. Cowart, D. Don DeLillo: The Physics of Language. Athens: University of Georgia Press, 2012. DeLillo, Don. White Noise. Penguin Group, 1986. Orwell, George. “Politics and the English Language.” Horizon, Apr. 1946: 1–10.